Home » Seo Tips » How To Optimize Your Blog Post Titles For Perfect SEO? How To Optimize Your Blog Post Titles For Perfect SEO? The reason most Blogger templates are not SEO friendly because Blogger templates were designed in a long time and have not been updated, probably since 2007, ever since Google SEO algorithm has changed and 'as blogger you do not want t be far away, to keep up with the competition by having your SEO Blogger template is very important and so this short article related to SEO to help you leave behind their competitors. If you are using a Blogger template, then you need to make some changes to it to meet your needs and to suit the needs of the search engine. Normally search engine focus on important profit margin, but it's a good thing to change it to something user friendly. Blogger templates as' Simple 'Travel', etc have h1 tag as the title of the blog is, what is normal. But the title of the announcement is not correct that everything is in a h3 tag, for many reasons, your blog can not be shown in search results and this is one of those reasons. You will not find any difficulty with a WordPress theme, and that are newly published and peer-reviewed, but Blogger templates were made by experts but not launched recently. As the search engines detect link anchor due to its strong then why can not see what the game is used for the area. 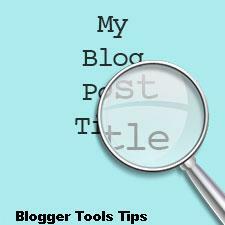 How To Optimize Your Blog Post Titles? 2: Go to the Template tab and click on Edit HTML and Expand Widget Template. 3: Fine the following line through CTRL+F. Here just change the <h3> to <h2>, change of only a number. But we aren’t done yet, remember there’s still an ending/closing tag. You have to change both starting and ending <h3> tag into the template. 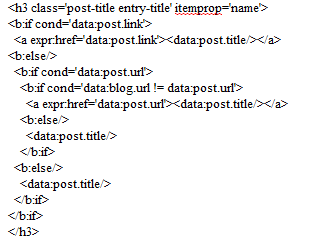 In the middle it’s all XML codes that works on the server to serve an HTML page. After you turn the starting h3 to h2, do remember to change the ending tag too or it will create difficulties while saving the template. 4: You will find the tag two times. one is for Desktop Version Template and another is for Mobile version Template. I recommend you to change all h3 that marks as the post title to h2. Searching for will <h3> bring up the codes but as i already said, remember to change corresponding closing tag too. Yes, that's it! Not only increase the visibility and beauty of your blog in search results, but also make your blog user friendly. Now stop using h3 for post title, h3 is only good in the body after heading. This was not a big change or addition of a better SEO for your blog, but remember this is how SEO works, there is no easy and direct way to reach the top of search results, the small and effective actions to take to regarding your blog makes it a success in SEO and search engines. Do not worry if your blog does not do too well in search results, keep posting and that is the most important aspect to reach the top. And this blog is always free to read, post test related to SEO Blogger rank for some amazing and subscribe to our posts coming. How to Encourage Readers to Follow Your Blog?